Dustin Pedroia was an All-Star and won the Gold Glove in 2013, leading the Red Sox to their eighth World Series championship, the second of his career. The Red Sox signed seven free agents before the 2013 season, none for more than three seasons. Team executives said it was part of a strategy to build a deeper roster by limiting the number of long-term contracts. That Dustin Pedroia would be one of those exceptions was certain, and in July the Sox signed him to an eight-year, $110 million extension. Pedroia is signed though the 2021 season and the Red Sox believe he will be an effective second baseman deep into that contract. But his value to the organization goes beyond that. The Sox see Pedroia as their leader, a conduit to the fans and an example to the younger players who will eventually join him on the roster. Manager John Farrell said during spring training that Pedroia embodies who the Sox want to be as a team. “Whether it’s in the clubhouse with some of the tendencies he may have, or, more importantly, the tone that is set on the field when we go through our work, he makes a difference,” Farrell said. “There have been a number of days in camp when we haven’t played a game yet and he’s covered in dirt head to toe. Guys look to him. They look to him to set the tone. Pedroia was an All-Star and won the Gold Glove in 2013, leading the Red Sox to their eighth World Series championship, the second of his career. But Pedroia should be even better in 2014. Remarkably, Pedroia played the entire season with a torn ulnar collateral ligament in his left thumb. The injury occurred on Opening Day against the Yankees when he slid into first base in the eighth inning with the Red Sox leading, 5-2. Pedroia required surgery but played the entire season unable to properly grip the bat. He hit .301 with a .372 on-base percentage, but had only nine home runs. Pedroia’s .415 slugging percentage was the lowest of his career for a full season. He hit only .238 with a .587 OPS in the postseason, but did drive in seven runs over 16 games. He finally had the surgery last Wednesday in Arizona, more then seven months after the injury occurred. 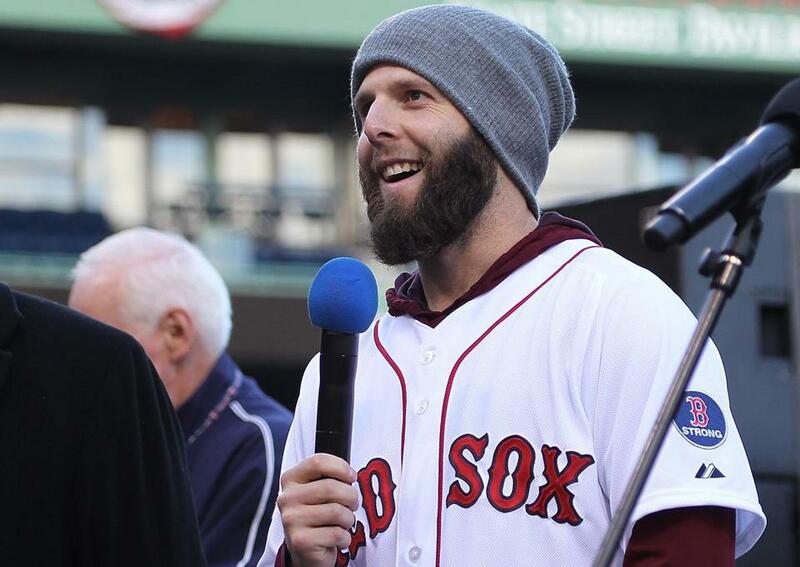 General manager Ben Cherington said that Pedroia should be ready for the start of spring training. But the Red Sox could work him in slowly during the spring to make sure his thumb is strong. Given the lack of other options at second base, a healthy Pedroia is paramount. Pedroia started 159 games of 162 in 2013 and played 1,398 of a possible 1,454 innings [96 percent] during the regular season. John McDonald, now a 39-year-old free agent, started two games and Jose Iglesias the other before he was traded to the Detroit Tigers in July. Outside of Pedroia, the only players on the 40-man roster with any second base experience are Brock Holt and Will Middlebrooks. Holt played in 26 games for the Sox, but had only one plate appearance after Aug. 9. The Sox hoped that Holt could develop into a utility player when he was acquired from Pittsburgh last winter as part of the Joel Hanrahan trade, but he has fallen back and may not last the winter in the organization, at least on the 40-man roster. Middlebrooks, a third baseman, played four innings at second base in September simply to give Pedroia a break late in games. Pedroia’s long-term contract could mean a position switch at some point for the team’s two best second base prospects, Mookie Betts and Sean Coyle. Betts, who turned 21 in October, hit .314 with a .417 on-base percentage in 127 games for low Single A Greenville and high Single A Salem. Betts developed his power this season, hitting 15 home runs, and stole 38 bases. The Red Sox rewarded Betts with a spot in the Arizona Fall League. He hit .271 and helped Surprise into the league’s championship game. Coyle, 21, was a third-round pick in 2010 and the comparison at the time was made to Pedroia because of his modest size. He has struggled at the plate in the minors, hitting .246 over four seasons. But Coyle was the MVP of the Carolina League championship series, going 5 for 12 with three extra-base hits. Counting the postseason, he had a .537 slugging percentage for the season.